Gathered with his adoptive white great uncles for the official reading of Grandpa’s will, Damey’s mind drifted back fourteen years. As an eleven year-old, he’d struggled with puberty issues and had underachieved in school and life. His mother, Shaundra, had delivered him at the age of sixteen into what he considered an unfriendly world. Moving into a Habitat for Humanity’s home across from William (Bill) Berkley, a retired secondary school teacher, turned into the first good break in Damey’s life. 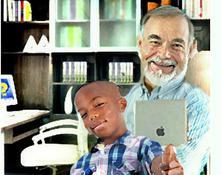 Bill stepped in to be his tutor, mentor, friend, confidant, and eventual adoptive grandpa. African American Damey and Alex, his Hispanic buddy, teamed up for games and adventures—including the time where the two found themselves lost in the woods after following a pure white deer. One cannot stay lost for long before nature calls. Damey cleaned himself using green, three-pronged leaves found in the woods—poison ivy. Sometimes, RediCares do not concern themselves with patient modesty. Later in the year, Xavier, Damey’s biological father, returned to the scene. Their initial contact left Damey suspicious and not liking him. His feelings never changed. Shaundra, who had fallen in love with the man at fourteen, wanted to pursue the relationship to see if her lingering feelings were real or imaginary. After Xavier visited a week in April, Shaundra and Damey drove to Oklahoma for two weeks to continue the journey. Damey and Xavier’s relationship deteriorated to the point where he slapped the boy hard enough to bounce him off the cupboards and into a heap on the floor. Damey’s fourteen year-old waitress friend had Googled directions for him and his mom to take back roads for their return trip to Michigan. Not willing to wait, he decided to ride a bike—almost 1100 miles. Good for all ages from 10-100. Over 100 might be a little shaky.